There is more information posted on Concussions under RESOURCES and ORGANIZATION. 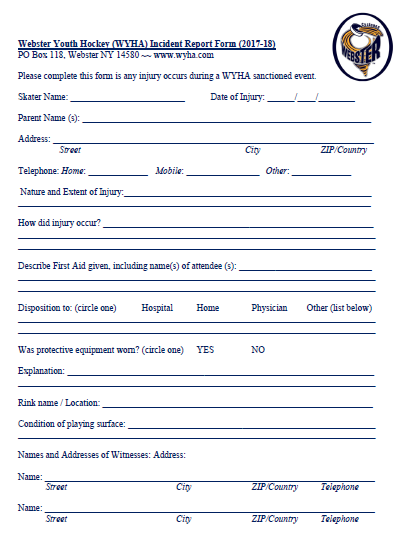 WYHA strongly recommends that a Injury Report be done for ALL injuries as Managers will not know if the player will need medical treatment later on. Players and Coaches who incur injuries can file with USA Hockey's insurance carrier - as a general rule USA Hockey's coverage is secondary coverage and their carrier will coordinate with the parents medical insurance carrier to provide coverage. 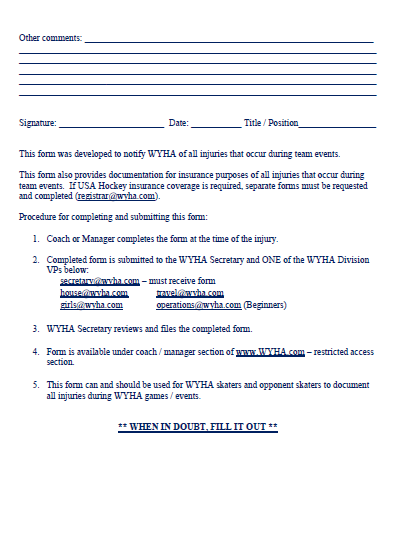 Obtain the necessary forms from the Registrar at registrar@wyha.com Once this form is filed, all discussions are between the the parents (or coaches) medical insurance company, USA Hockey's carrier and the medical personnel involved. For medical privacy reasons, WYHA is NOT involved in this process.